Thanks again for the wonderful service that you provide! I'm having a problem cycling my new 155 in-wall reef tank. I have been using Dr. Tim's nitrifying bacteria and have attempted to contact them without luck. I've followed the manufacturers directions by adding the bacteria followed by the ammonia chloride. I've been keeping my ammonia at about 2ppm but have had my nitrites skyrocket. The test kit goes to 5ppm (API) but it seems that the color is at or above this. I have been doing 15% water changes (more challenging in the new tank then in my old 54 gallon!) but the levels do not seem to be dropping. I'm confused as to what steps I should take to correct the problem. Should I continue keeping ammonia at above 2ppm or continue water changes to get the nitrites down? The cycling started about 2 1/2 weeks ago and the manufacturer claimed that it should be completed in less then a week. Lastly, the tank is has about 100 lbs dry rock and about 15 lbslive rock. I'm currently running the skimmer. Always a pleasure to chat with you. You don't know how many times I've had the Hendrix comment made to me! Luckily that's one of my favorite tunes! I was under the impression that the high nitrites were poisoning that necessary bacteria and must be lowered. I'll go ahead and add the cocktail shrimp and halt on the water changes. I've attached a photo of the tank before it was filled with water. The contractor really did a nice job with the exterior. Thanks Bob for the referral. Not sure how you tried to contact us as we have no record of a phone call or email. In any case you did not follow the directions we have on the website. You are not suppose to 'keep" your ammonia at 2 ppm =- that is too much ammonia which has resulted in the high nitrite level. You need to do a water change asap and get the nitrite down. The faster you get the nitrite down the faster the system will cycle. Once you get the nitrite down you need to add ammonia and wait 24 hours before measuring. Measure and if ammonia and nitrite below 0.1 then add some more ammonia. Do not add more if either it above 3-2 ppm wait another 24 hours. Very kind of you! Have a relaxing Labor day holiday! Firstly let me say thanks for such an informative site. Your threads have answered many questions so far. I am a SW newbie, so, I apologise if any of my questions seem silly or paranoid! It is sometimes hard to get reliable information from anyone and so many differing opinions it can be a little confusing at times. My plan is to have a reef tank, however I will certainly be taking my time before I get to that stage. I have a 55g tank, canister filter containing Matrix NOT bio balls (filter circulates tank water 5+ times per hour) approx 30kg live rock(semi cured), protein skimmer, power head (to assist in water circulation), crushed coral sand. My lights and skimmer have been running as they would once tank is established and livestock added. Water tests have been done pretty much daily. As the tank is still cycling I have added nil livestock at this point. 1 x brown worm (not sure if he is still alive as hasn't moved for a couple of days) Cannot find this creature in any of the searches that I have done!! Sorry I can't be more descriptive than that but his head (or tail) is only just poking out of the rock. What looks like a flatworm but is deep deep blue/purple, only comes out several hours after lights out, very skittish and retreats back into the rock even with the room lights on. Several other crawlies that I have yet to identify. There are small algae blooms on some of the live rock and an occasional dusting of them on the glass every couple of days, though this is barely noticeable. Water changes now and in the future will be/have been sea water (available at my LFS). Is it normal for a tank to cycle so quickly? How could I possibly have enough "good" bacteria so quickly? Surely I couldn't? Is it normal to have no nitrite spike? Could the stability assist in "hiding" a nitrite spike? Should I be concerned with the amount of critters that I have at this early stage? Am I doing something wrong or is this all normal??? Would you suggest adding some critters now or waiting? (to keep algae and worms under control). Should I just keep doing what I am doing? Thanks for the info Bob. I'll certainly try to use the search tools. Also, I have tried but can't find answers to this anywhere. I did a 2 hour drip acclimation and tested the salinity of the tank and their acclimation tank with a refractometer before I put them in the tank. were 5. The tank had cycled for 2 weeks and seemed to be pretty stable at this point. Now 4 days after adding the 3 Damsels, Nitrite is nearly 1, Ammonia is .25 and Nitrate is 10. On the day I put the Damsels in, I waited 8 hours for them to acclimate before feeding. Then I gave them a small pinch "about 1/16 tsp" of "instant ocean marine chips omnivore diet" which they ate readily. They appeared timid, but not so much that they couldn't be seen. On Day 2, they ate less and hid more. On Day 3, they wouldn't come out of hiding at all. I've tempted them with garlic extreme and they still won't come out of their VERY well hidden holes in the rock. Would 3 juvenile Yellow Tail Damsels cause a 45 gallon tank to re-cycle? The only other thing in the tank is 10 tiny blue leg hermits. I know that's WAY too high for Nitrites, and am adding Purigen packs to the filter sock to try to reduce it. Hope all is well and Happy Father's Day to all you dads. I'm currently having a bit of an issue with trying to navigate through your site as there appears to be a search engine issue. 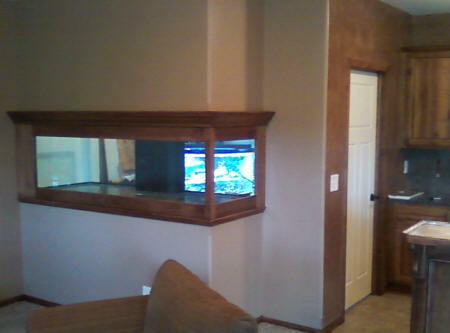 I had set up a 30 gallon half moon aquarium back on May 28, 2011. It's going to be a new tank for my mated pair of Hippocampus erectus seahorses. They are now being currently housed in a fully cycled 10 gallon QT because their old 20 gallon high tank has sustained a crack in the glass. I removed 8 lbs of fully established Florida LR and added 2 lbs of fully cured Fiji Pukani LR and 12 lbs of dry rock. I removed the aragonite sand which was around 10 lbs and added it to 50 lbs of dry aragonite sand. I experienced an ammonia spike of 1 ppm 3 days after setup. I continued to monitor the cycle and never saw a rise in nitrites or nitrates. They stayed 0 since set up. The ammonia took around 2 days to go to 0. I have been feeding a pinch of fish food everyday to see if there was any change in the stats and I have not seen any. Is there a possibility that this tank cycled quicker due to having established sand and rock? I'm so used to seeing the ammonia, nitrite and nitrate cycle and I'm a little confused as to why I'm not seeing in this set up. Thanks again for such an awesome site and all the help you give us. Thanks for the very speedy reply :). I have new API kits and I even brought samples to my LFS who uses Salifert and they match what I've been seeing. I don't want to see my poor horses suffer in a tank that might have been not truly cycled, but I don't enjoy seeing them being crammed in a 10 gallon either. Do you think as a pre-cautionary note to have some Bio-Spira on hand just in the off chance of another spike? To let you know that I had been keeping marine tanks for 6 years now before I took the plunge with seahorses. More experience in keeping marine life the better before going into such delicate creatures. I've been told by a few other folks that keep seahorses that I was on the scant side of LR. and also getting ready to add some sea grass and macro-algae to this tank. Thanks again for your valuable help. sit around the same levels and don't seem to go up or down. Vortech MP10, stock heater, 2x55W Compact fluorescent lighting, and the skimmer plus media listed above. So my questions are first of all should I shut down the skimmer and remove media? Second should I leave my lights off? now since what I read says to not do water changes during the cycle. Should I be doing water changes? I am setting up a 20 gallon marine tank with a 100 watt heater, two power heads (one with canister) and 2 24 watt PC bulbs with generous sand bed (1.5 inches depth). I have some experience within the hobby but I am would really benefit from someone with more knowledge in the area. I have recently set up my tank in a very isolated place in Australia (in the middle), and I placed some live rock (1kg) within the tank (about 3-4 weeks ago). After about three days (approx) an ammonia spike was then followed by a nitrite spike 1.0-2.0 mg/L. After some a period of days the spike began to subside. At this point I went on holidays to the coast (1500kms away). During this time I came across awesome pieces of rock (required) and various coral frags (desired). As logistics is an issue I decided to capitalise on the opportunity as my tank would surely be cycled. After packaging both rock and frags they undertake a 1500 km trip over a 13 hour period. That night I check Nitrite and pH and find that the 10 days I spent away has resulted in no detectable nitrite, a good pH (8.2), and thick algal growth. My assumption is that the system is reasonably established. Sure of present nitrate I do a 10% water change and then add newly collected rock and frags (water looks good/no smell). Next morning my system looks like the Chernobyl incident with extremely poor water clarity (smells dead). After checking, nitrite jumps to 1-2 mg/L. panic stations are at the fore and I remove possible dead material and do a 40% water change. Testing again I find that ph is about 8.0 and nitrite remains the same. retests show a nitrite of 0 (?) and pH weak but stable at 7.8. I am clearly perplexed. Is this the work of the bag? Are nitrates still responsible for the poor water clarity and smell? Where is the tank at now? And do you have any advice to extend the life of the inhabitants through what I had thought to be a finish tank cycle? Cheers Thank you for your thoughts. P.S. Although I didn't say it before; the depth and knowledge in your site is pretty much the definitive source (in my opinion) for anything to do with my aquatic system and interests, you people do a great job in maintaining such a knowledgeable and descriptive website, thanks heaps! Strange spike in my water quality 2-25-08 Hello Again WWM Crew! I hope your day is going well. <No biostatistics today! Yay!> I have a question about a strange spike in my water quality numbers. <Alrighty then> I have a 125g FOWLR tank (about 50lbs of LR and 100lbs of LS). My numbers were all within range (ammonia 0, nitrites 0, nitrates 5-10, ph 8.2-8.4) for a couple weeks, then I added my livestock about two weeks ago. <What, pray tell, does "Livestock" entail?> The numbers since then have been the same, but Friday night when I tested, I did not expect the results I received: (Ammonia .50, Nitrates 3.0, Nitrates 20, ph 8.2). I quickly did a 20% water change, and let the tank "settle" overnight. Saturday morning, I tested again, and even with the water change, I had identical numbers: (Ammonia .50, Nitrates 3.0, Nitrates 20, pH 8.2). I did another 20% water change Saturday afternoon, and checked again Sunday morning...almost Identical numbers again: (Ammonia .25 [slight drop], Nitrites 3.0, Nitrates 20, ph 8.2). I did yet another 20% change Sunday night, and just checked again this morning, and the numbers are the same as yesterday: (Ammonia .25, Nitrates 3.0, Nitrates 20, ph 8.2). The other thing I have noticed is that there seems to be some growth in the tank. Not much at all, but there are a few resin ornaments we have in the tank and there seems to be a brownish algae growing on the tops of them. <Not at all unusual, especially during a cycle> My question is, is it possible my tank is re-cycling for some reason? <Most likely> Also, what course of action should I take? Am I not changing enough water (20%) to make an impact on the numbers, or are the nitrites and nitrates holding steady because the tank is cycling (again?). <Sounds like you simply added too much biomass too quickly, with a possible of lack of adequate biological filtration. Water changes are going to interrupt this second cycle, so I would cease the water changes, add Amquel+ or Prime daily to neutralize the ammonia/nitrites, and add a 'cycle booster' type product (I like SeaChem's' Stability) to 'jump start' your biofilter. Next time, don't add animals as quickly!> I appreciate any thoughts and suggestions. As always, thank you for your time and your help. <Anytime> Mike P.